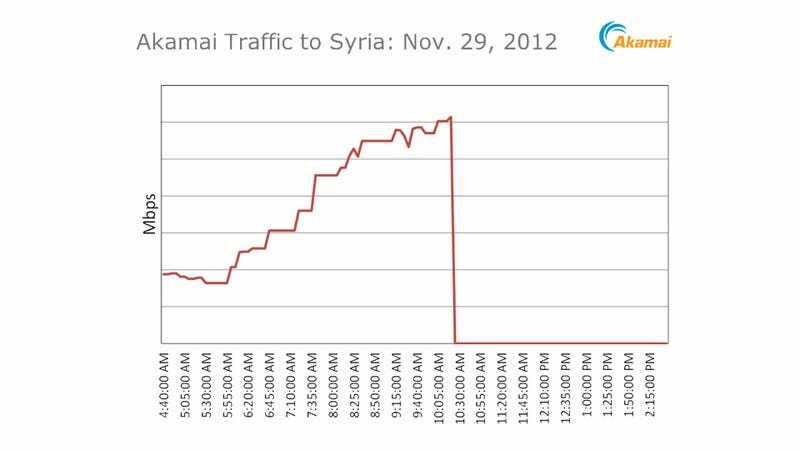 Lights out, rebels: it looks like the Syrian government just blacked out almost the entire country's access to the web. This is cyber warfare. Internet-monitoring firm Renesys says "77 networks experienced an outage in Syria starting at 10:26 UTC on November 29. This represents 92% of the routed networks in the country." That's a big chunk of the country's infrastructure that just went dark. Danger Room spoke to an activist working with Syria's rebel forces who confirms the outage. Update: ABC News reports phone service is severed, too. Update 2: The graph above says it all. Update 3: Renesys has a blog post up with a thorough look at the blockage.